Now my hair is the longest it's ever been, I've been struggling to style it myself. I'm determined not to cut it off though so when Elizabeth (who blogs here and keeps me sane at swimming classes each week) told me her Babyliss Big Hair means she finds her long hair so much easier to manage AND she no longer goes to the hairdressers for regular blow-dries, I knew it was time to try one out. So I took the people at Babyliss up on their offer for me to review one of their products. The next day, my New Big Hair arrived (impressive service) and I've spent the last few weeks trying it out. It's called the NEW Big Hair because it's an improved version. It's got a more advanced bristle brush than the older version and has ionic technology which helps the hair to look even more shiny and super smooth. Now if you're interested in buying one of these, I urge you to look at this video from QVC - click on the Video Tab on top of the photograph to start the show as per the image below! It shows celebrity hairdresser Beverley C demonstrating the Babyliss live on TV. I personally found this really useful to watch because even though I'd read the instruction manual, I learned a few tricks from Beverley for getting the best finish. There are also loads of video tutorials on You Tube that will show you how to get the best result. For the best results, use it on hair that is already 80% dry. So either blast dry your hair for a bit or leave it to dry naturally. Then you take a section of hair (big grips are your friend here! ), turn on the Big Hair and run the brush through the section. Once you've got the hang of that, you can start using the rotating brush to style the hair. Now this does take a bit of getting used to. There are two buttons that rotate the brush either way. You will very likely have a few moments where the hair gets wound up a bit too fast but just rotate the brush the other direction to unwind. There are two heat settings with the lower heat setting having a slower rotating brush so you might want to start out using it to prevent any knotted hair as you become accustomed to the technique. This double rotation means you can curl the hair outwards or inwards or both ways for a gorgeous tousled hair look. The verdict? I used to go for a blow dry about 3 times a month as I couldn't manage my hair myself. I've only been once for a blow dry since I got my Big Hair and that was because I had a voucher that was about to run out. I normally pay £8 for my blow-dry so I've already saved myself more than the Babyliss cost. I'm enjoying doing my hair when it suits me and achieving a salon look at home. I only wish I'd gotten one a year ago! 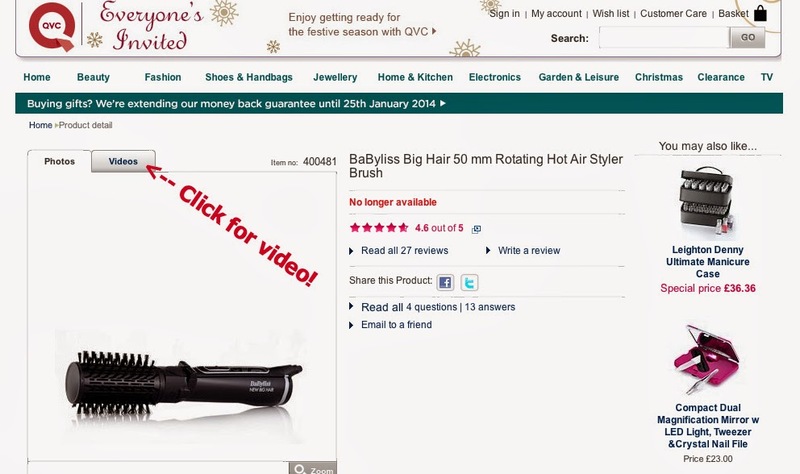 The Babyliss is available in most good electrical outlets and online stores...the best price currently with a reputable brand is in Boots, where it's £39.99 with 156 Boots Advantage Points (and more if you've Advantage Card vouchers) and free pick up from your local store (£2.95 delivery). It's also available here on the QVC website for £36.36 plus £4.95 postage. If you are searching online, just make sure you're not paying over the odds for the older version. Look out for 2885U if you want this newer version! Some retailers are still charging around £40 for the older one (2777U). Disclaimer - my Babyliss New Big Hair was provided to me free of charge but the review is all my own. I only keep and review items that I genuinely use and am happy to recommend to readers. I bought one of these on your recommendation as couldn't get in a trip to hairdresser over Christmas and then away, have to say its brilliant and love it, thank you for top recommendation! This is something that I would love to try. Not sure if it is available in the states though. Thank you so much for sharing! I have heard these are very good. Would love to see your hair styled with it.